Krystian Bellière is a versatile artist working as a solo pianist, vocal coach and conductor. As a solo pianist he made highly acclaimed London débuts at the Wigmore Hall, the Purcell Room, St. John’s Smith Square, Cadogan Hall, St. Martin-in-the-Fields and Steinway Hall. He has also given recital and concerto performances throughout the UK, Germany, Italy, Israel, Japan, East and South Africa and broadcast frequently on BBC Radio 3. Born in London, Krystian Bellière comes from a family of English, French and German origins. In his teens he concentrated on composition and was taught piano by Ronald Smith before being awarded an instrumental scholarship at Christ Church, Oxford where he gained a First in Music. Further study followed at the Guildhall School of Music & Drama in London where he majored in conducting, studying in master classes with Michael Tilson Thomas and where his piano teacher was James Gibb. Subsequently he undertook intensive courses with Murray Perahia, Alfred Brendel and Stephen Kovacevich. His involvement in the world of music theatre is extensive and he has a repertoire of over thirty operas. He made his début at the Wigmore Hall in 2004 directing Viktor Ullmann’s opera Der Kaiser von Atlantis from the keyboard, subsequently touring nationally. In addition he has directed performances of Le Nozze di Figaro, Così fan tutte, Hänsel und Gretel, Werther and spent two years as a Kapellmeister in Wiesbaden, Germany where he assisted on numerous productions and conducted Der Vogelhändler, My Fair Lady and Sweet Charity. 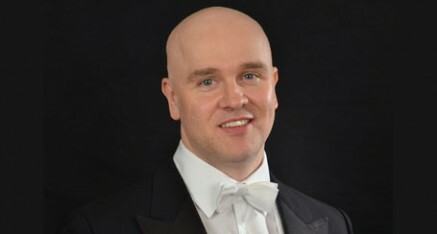 He works as a repetiteur for the Royal Opera House, Covent Garden, English National Opera, Grange Park Opera and enjoys partnering some of the world’s finest singers in recital.